How much are your puppies? Our English Cream Golden Retriever puppies are priced at $2,000 (Male or Female). 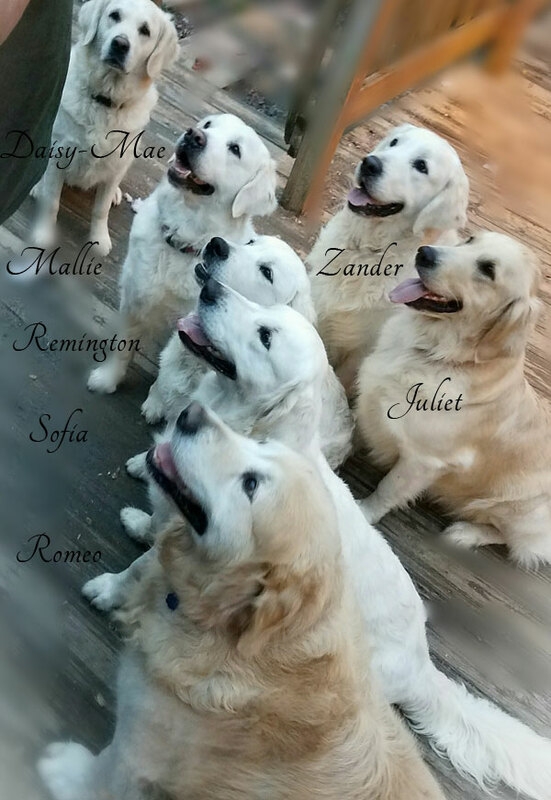 Our blended American/European "Ameropean" Golden Retriever puppies are priced at $1,500 (Male or Female). All puppies come with AKC limited registration. What is the difference between limited and unlimited AKC registration? Limited registration means the dog will be a family pet or companion and the owner will not be able to use the dog for breeding purposes. Unlimited registration means there are no limitations on breeding or showing. Is it possible to get a puppy with unlimited AKC registration? Unlimited registration is sometimes available to approved breeders only once the following conditions have been met. The puppy must reach at least 2 years of age and at the expense of the new owner must have achieved all required health clearances. After we have received true copies of the health clearances then the buyer will be able to purchase the breeding rights for an additional cost. Can you ship my puppy? We understand that there are people from all over the United States interested in our puppies. As we prefer that you come to us, we know that is not always a possibility. If driving is out of the question because of distance then we will definitely try to help you to find the best ground shipping available. Also, many people find it reasonable to get a round trip ticket. We are more than happy to pick you up at the airport or even have the puppy there at the airport to meet you upon your arrival. It is much better for the puppies to be with you on a flight than to fly as cargo. If that's not a possibility then as a last resort shipping by air may be possible. Cost for shipping by flight is $400 which includes the plane ticket, crate and any additional travel expenses. I want one of your pups so what is the best way to make sure that I get one? Timing is everything so act quickly! Request an application or complete our online application. Once we notify you that your application has been approved then place a deposit to ensure your spot for litter choice to reserve a puppy. The non-refundable deposit required amount is $300.00. What happens after we have reserved a puppy? Congratulations! You are in for an exciting adventure. We will post pictures and updates to our website and to our Facebook page English Cream Golden Pups of Golden Miracles. When do we pick our puppy and when can we bring it home? When puppies are 7 to 7 1/2 weeks old you will come and pick out your puppy to take home. We will go in deposit order and each family will get the chance to play with the remaining puppies and of course we will help you chose. PLEASE be aware that we will want to help guide your decision. We have been with these guys every day of their little lives. The puppy that runs over and licks you may have just done that to all the other families before as well. Your perfect puppy may be sound asleep. Once a puppy has been selected and you receive your paper work and puppy goodies you are free to take your baby home. How can I pick our puppy if I cannot come to you? You will still pick in the deposit order and when it is time for you to pick then we will contact you. Once you have had an opportunity after viewing weekly pictures and updates, you may already have one in mind. This is also where you can depend upon us to help you choose the perfect available puppy for you and family. What should we feed our dog? Your puppy has been weaned to Purina Pro Plan. We send home a sample bag of this food with our puppies and recommend that you continue with this nutritional food.